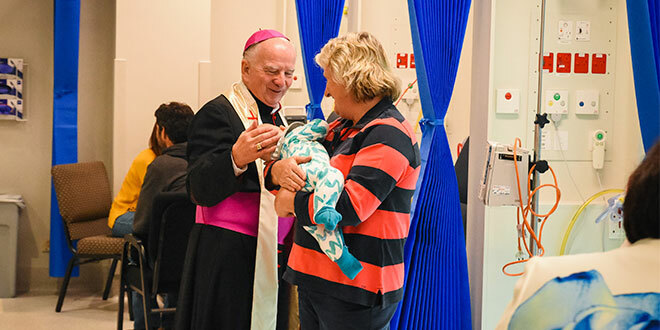 Opening: Bishop Robert McGuckin offering a blessing to the baby and chatting with members of the public who were in recovery at the opening of the Clive Berghofer Operating Theatre Suite. THE opening of the Clive Berghofer Operating Theatre Suite on February 21 heralded a new chapter in the 96-year history of St Vincent’s Private Hospital, Toowoomba. The $30 million theatre complex, which added six new state-of-the-art operating theatres including a cutting-edge hybrid theatre, a new kitchen and a new main reception area for the hospital has been completed under budget and two months ahead of schedule. Hospital chief executive officer Kathryn McKeefry said the theatre complex building project had been a success from the first day of construction and delivered much more than new facilities for the hospital. “Hutchinson Builders managed the build so well they were able to hand back the space to us before the end of last year, which enabled us to undertake the monumental task of commissioning the theatres and orientating our staff and the surgeons in preparation for the first cases in January and early February,” Ms McKeefry said. “Our new theatres are contemporary and spacious and equipped with the latest technology and equipment, which will enhance the experience for our staff, surgeons and patients. “From a clinical perspective, the inclusion of a hybrid theatre has enabled us to introduce a new cardiac diagnostic service in partnership with Heart Care Partners. The benefits of the building project do not end with the introduction of new clinical services and an aesthetically pleasing environment. “Last year was a big year for St Vincent’s Private Hospital Toowoomba and we are grateful to the Trustees of Mary Aikenhead Ministries and St Vincent’s Health Australia for their $25million investment in the hospital’s future,” Ms McKeefry said. Toowoomba Bishop Robert McGuckin led a liturgy and blessed the new theatre suite.